Do you have a requirement for holding open fire doors in your property? Is wiring difficult or impossible? 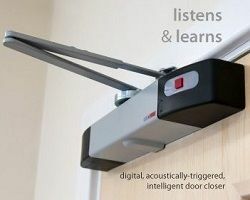 Well look no further than our wireless battery powered hold open door closers and holder range. These units are designed to be activated by the sound of the fire alarm system. For more information on this range of products call us NOW on 01200 428 410 or use the Live Chat facility below. The first products in our range of products are the Wireless Battery Powered Overhead Door Closers. This range includes the Geofire Agrippa Wireless Overhead Door Closer and Fireco Freedor units. Both products are battery powered and require no external cables in order for them to operate. They are activated simply by the sound of the fire alarm system. Upon the fire alarm system being activated they release and close the fire doors to create fire separation areas within the building. In addition to the overhead door closer type units, we also have the door holder type units. These devices are designed to be used together with traditional overhead door closers. This range includes the Geofire Agrippa Door Holder and Fireco Dorgard units. Again these devices are designed to be operated by the sound of the fire alarm system. The Agrippa devices are typically installed on the wall behind the door, whereas the Dorgard units are mounted directly onto the door itself. If you’re interested in these products you may also be interested in our Premium Engineers Call Point Key Pack and First Aid Points which have been recently added to our product portfolio.